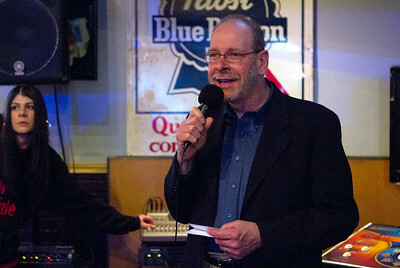 Mike Greene - For Shaw Media Mike Neal speaks during the third annual Walk for The Brighter Side fundraiser Saturday, April 11, 2015 at Nero's Pizza & Pub in Algonquin. The event featured a photobooth, 50/50 raffle, a raffle for over 60 donations, speakers and a buffet donated by Nero's Pizza & Pub. 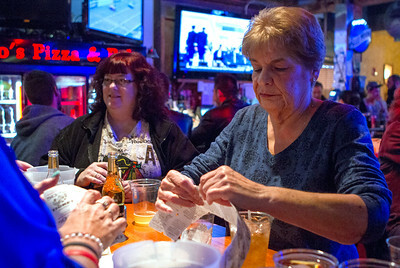 Mike Greene - For Shaw Media Linda Mraz, right, of the Fox Valley Childrens Organization, breaks off raffle tickets for Karen Seals, of Carpentersville, during the third annual Walk for The Brighter Side fundraiser Saturday, April 11, 2015 at Nero's Pizza & Pub in Algonquin. This is Seals' second year attending the event, which she supports in honor of her daughter Samantha who suffered from Bipolar disorder. 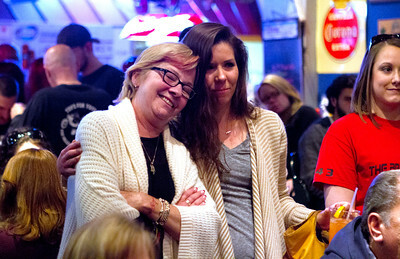 Mike Greene - For Shaw Media Trish Neal, left, is embraced by Sarah Alich, of Crystal Lake, while listening to Mike Neal speak during the third annual Walk for The Brighter Side fundraiser Saturday, April 11, 2015 at Nero's Pizza & Pub in Algonquin. The event featured a photobooth, 50/50 raffle, a raffle for over 60 donations, speakers and a buffet donated by Nero's Pizza & Pub. Mike Greene - For Shaw Media A skateboard signed by friends of Ryan Neal hangs during the third annual Walk for The Brighter Side fundraiser Saturday, April 11, 2015 at Nero's Pizza & Pub in Algonquin. The event helps raise funds for the American Foundation for Suicide Prevention McHenry HS Campus Walk Out of the Darkness Community Walk April 25, 2015. 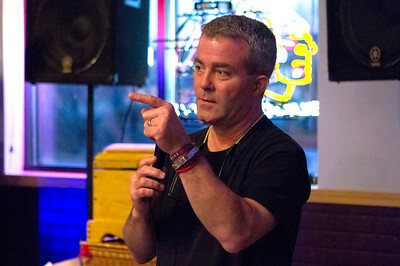 Mike Greene - For Shaw Media Gary Rukin, of the McHenry County Suicide Prevention Taskforce, speaks during the third annual Walk for The Brighter Side fundraiser Saturday, April 11, 2015 at Nero's Pizza & Pub in Algonquin. The event featured a photobooth, 50/50 raffle, a raffle for over 60 donations, speakers and a buffet donated by Nero's Pizza & Pub. 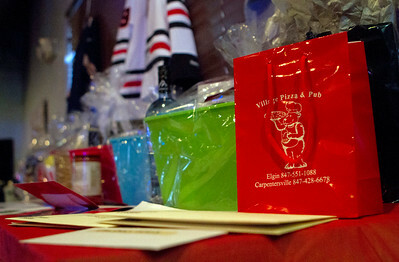 Mike Greene - For Shaw Media Over 60 prizes were donated to be raffled off during the third annual Walk for The Brighter Side fundraiser Saturday, April 11, 2015 at Nero's Pizza & Pub in Algonquin. 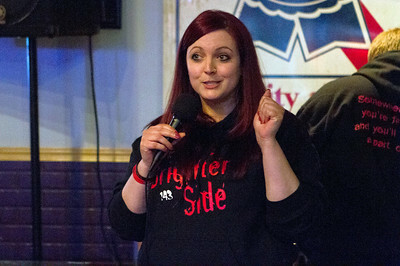 Mike Greene - For Shaw Media Brittany Shelby speaks during the third annual Walk for The Brighter Side fundraiser Saturday, April 11, 2015 at Nero's Pizza & Pub in Algonquin. The event featured a photobooth, 50/50 raffle, a raffle for over 60 donations, speakers and a buffet donated by Nero's Pizza & Pub. 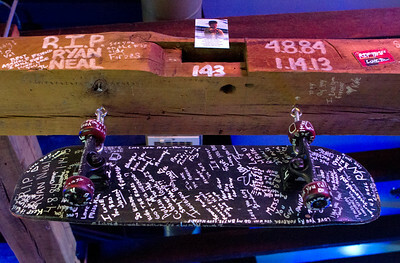 A skateboard signed by friends of Ryan Neal hangs during the third annual Walk for The Brighter Side fundraiser Saturday, April 11, 2015 at Nero's Pizza & Pub in Algonquin. The event helps raise funds for the American Foundation for Suicide Prevention McHenry HS Campus Walk Out of the Darkness Community Walk April 25, 2015.